My painting is predominantly process oriented. My approach to making is open to accidents to encourage the emergence of spontaneous forms as well as record the frenetic pace of daily life. By using an energetic paint application, vibrant colors and varied mark making, the picture surfaces often pull and bounce to create tension and movement. An aggressive and haphazard paint application allows for shapes and spaces to emerge that are not predetermined, but may later be refined to develop the picture’s composition, create loose narratives and suggest figurative elements. It is this point of the process that is of particular interest to me–the picture may allude to recognizable elements but is left abstract for a multitude of interpretations and meanings. Despite undertones of imbalance, agitation and speed, my work strives to relay a feeling of exaltation and hope. Liz Leggett’s art has been exhibited nationally and internationally and she has participated in artist-in-residence programs in Israel, Spain, The Pyrenees Mountains, Nova Scotia, Saratoga Springs and most recently for the second time at Weir Farm in Wilton, Connecticut. She received her BS in Studio Art from Skidmore College and MFA at the Maine College of Art. Liz recently illustrated a children’s book, has been a guest lecturer, participated on discussion panels, taught painting and has received awards and grants for her work. 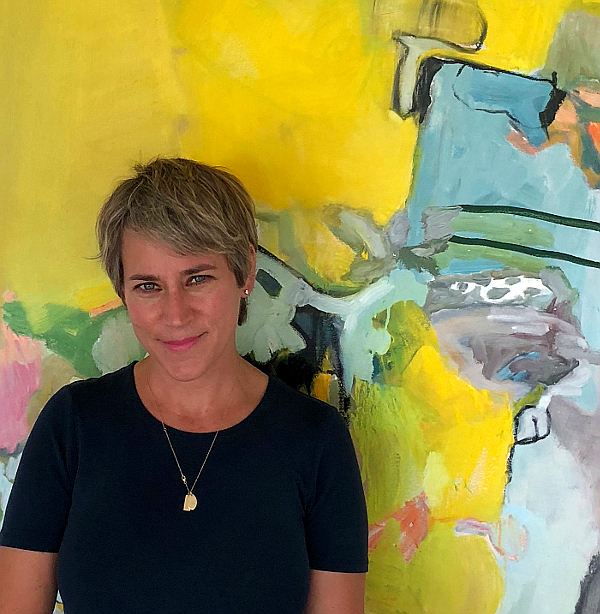 She is a member of the Artist Collective of Westport, currently works as the Visual Arts Project Manager for the Westport Arts Center and was inducted into the Silvermine Guild of Artists in 2018. Liz Leggett lives and works in Westport, Connecticut with her husband and two boys.